Come swim with our dolphins if you're planning a vacation in Panama City Beach. Our dolphin Swim Journey allows visitors to interact with these brilliant creatures in an environment where they feel comfortable and free to show off their tricks. This is a wonderful vacation experience. At Gulf World in Panama City Beach, we love to share our dolphin friends with visitors. The dolphins look forward to the human interaction and they love to play with everyone in the water. What's most exciting is that our facility is the only place in the world where guests can interact with both a bottlenose dolphin and a rough-toothed dolphin during the same adventure. These marine mammals have amazing personalities and our guests have the time of their lives playing in the water with them. When you visit our facility, you have the chance to spend time in the water and interact with the dolphins with a small group of up to four people at a time. The dolphins can do several tricks including double dorsal, mimics, and hand targeting. They will also offer visitors a kiss and handshake. During the double dorsal, visitors will be pulled across the water as they hold on to two dolphins from their dorsal fins. When visiting the Dolphin Swim Journey, your admission will also include several other fun activities. You can watch the Sea Lion Show, Dolphin Educational Show, and the Friends and Furry Show. These shows are fun for children and offer a great opportunity to learn about some of the interesting animals we have at Gulf World. Our dolphin swims are available daily at 3:15 PM. Visitors can purchase prints or a CD of the dolphin experience separately. We have professional photographers capturing each moment during each swim session. Each swimmer may bring up to two observers with them to view the dolphin swim from un-shaded observation areas. Swimmers should be 18 years or older and 4'7 or above to swim in our program alone. We require the use of life vests in all of our water programs and we do provide them in various sizes. There are a limited amount of lockers at the facility so we ask that guests don't bring valuables that need to be stored. The swimming area does not have a platform for standing so swimmers should be capable of treading water for around 30 minutes. Visitors can swim and interact with the dolphins for around 35 minutes. This gives plenty of time for everyone in the small group to see all the tricks and play one-on-one with the animals. Unfortunately, this program is not for expectant mother or young children. If you're bringing children with you, please be sure to have someone to supervise them while you're in the water. 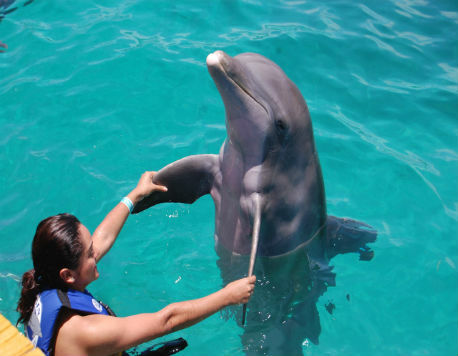 We want everyone in your party to have a great time at Dolphin Discovery. Participants must be 18 years old and at least 4’7" to do program by themselves. The use of life vests is required in all water programs. At Gulf World we have groups of up to 4 people for Swim Journey. Only 2 Observers are allowed per swimmer. Observer areas are not shaded. Due to the fact that there is no platform in this habitat, participants must be able to comfortably tread water for 30 min. Participants will be measured before participating in program at check in. Bring your swimsuit and towel (recommended wearing suit under clothes). Every Swim with a Dolphin encounter is photographed by our professional photographers.